So this is a real kick. One of the things long-time comics fans love are the interstitials that used to appear in their fave Silver and Bronze Age mags. Y’know, maps of the Batcave or cutaways of the Baxter Building. Or just big, ol’ full-page illustrations of DC and Marvel’s larger-than-life heroes and villains. That sort of thing. They weren’t throwaways — not by a long shot. Rather, they enriched the reading experience and often gave us the sense that we were getting a behind-the-scenes glimpse of our heroes, even if it was all fictional. An incredible artbook showcasing some of the greatest comic artists of all time! Jack Kirby, Steve Ditko, Jim Steranko, Don Heck, John Byrne, Barry Windsor-Smith, John Severin, Wally Wood, John Romita, and many more! As part of the tremendous fun of Silver Age comics, artists created pin-ups of the most popular Marvel heroes and villains! Now the greatest of those works of art are gathered for the first time in a beautiful large-format hardback book! Included are rare examples of original art of the Thing, Spider-Man and Dr. Strange. 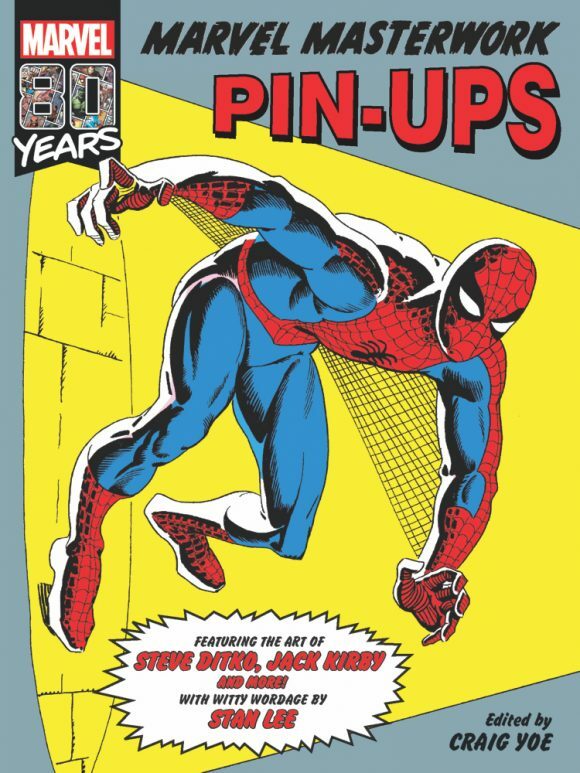 True believers, thrill to pulsating pinups of Spidey, Thor, Iron Man, Captain America, the Avengers, Nick Fury, Daredevil, Millie the Model (! ), and the ever lovin’ blue-eyed Thing — and many marvelous more! The 9″ x 12″, 120-pager will list for $34.99. Mighty affordable, I’d say. Anyway, Craig himself crowed on Facebook on Tuesday that this is the first in a line of new Yoe Books spotlighting Marvel — a substantial departure from his traditional focus on bizarre horror, romance and other wonderfully weird genres. Very Cool Idea for us older fans!! They couldn’t have picked a better cover. Beauty! Sounds a really good book – always loved those pin-up pages and I am certain there will be a few I have never seen before. Already pre-ordered !